This is a strange movie. It spends most of its runtime as an operatic western, a tale of ranchers in Mexico and forlorn love — like a 1950s version of All the Pretty Horses — but then a frickin’ dinosaur shows up to the party. From 1956, The Beast of Hollow Mountain was directed by Edward Nassour and Ismael Rodriguez, from a story by legendary effects man Willis O’Brien (using the bizarre pseudonym El Toro Estrella). Apparently, O’Brien was also on tap to do the effects for this film, but for one reason or another that didn’t happen, and the duties passed to inferior substitutes. The film follows ranchers Jimmy Ryan (Guy Madison) and Felipe Sanchez (Carlos Rivas). The two have everything they own sunk into a ranch south of the border, only they made the mistake of setting up near Hollow Mountain, which an opening voiceover informs viewers is a mysterious and dangerous place. And it is, but not for the first hour of the film. That’s because before the beast promised us by the title shows up, there’s a whole lot of drama to be gotten through. Enrique Rios (Eduardo Noriega) is another rancher who isn’t that fond of Jimmy. For one, Jimmy is from the States, and Enrique doesn’t appreciate some gringo coming down south and undercutting the prices on Enrique’s cattle. For another, Enrique’s fiancé, the lovely Sarita (Patricia Medina), has been making googly eyes at Jimmy — affections which he reciprocates. Some of Jimmy and Felipe’s cattle has been disappearing in the foothills of Hollow Mountain. The ranch hands, being locals, know the legends surrounding the mountain, and they believe some ancient evil has stirred and is behind the loss of cattle. Jimmy and Felipe, however, see the sinister hand of Enrique. Enrique has made it clear that he wants Jimmy to clear out, and with a big cattle sale upcoming, the two ranchers believe that Enrique is doing all he can to sabotage the herd. It does turn out that Enrique is not completely innocent of skullduggery, but most of the problems with the herd can be traced to what lurks around Hollow Mountain. What follows is a pretty standard, 1950s, sappy western romance. But then, with a half hour left, the beast makes its first onscreen appearance, and the film goes completely off the rails. The stop motion work and modeling, to put it simply, is awful. Everything else about the film is professional. The cast was able, the pace and storytelling were tight, and the film looks much better than one would expect from monster fare of the time. It was filmed in CinemaScope widescreen and used a decent color film stock. It’s a film that draws on decades of technique in bringing westerns to the screen, but then the filmmakers used sub-par creature effects and ruined it all. It really is a spectacular contrast. I feel like the people involved in this film were betrayed by the post-production work. They filmed a decent, if anonymous, western and went on to other things. Meanwhile, the effects crew failed the film. Maybe there wasn’t enough money left in the budget after principal photography to pay for decent effects. Maybe the replacements for O’Brien were just incompetent. Whatever the reason, the beast looks silly and stupid, and ruins the movie. This movie was filmed in both Spanish and English versions, so somewhere out there is a version that was released in Mexican theaters. I would like to see that version, for curiosity’s sake, because I imagine it had a slightly different plot for Mexican audiences. The Jimmy character is too much the great white hero, while Enrique is dark and dastardly. It wouldn’t have taken much tweaking to make Felipe the main hero for a different audience. But, it was hard enough to find a print of the English version. The film has fallen into the public domain in the states, and its poor overall quality means it hasn’t exactly been taken care of. 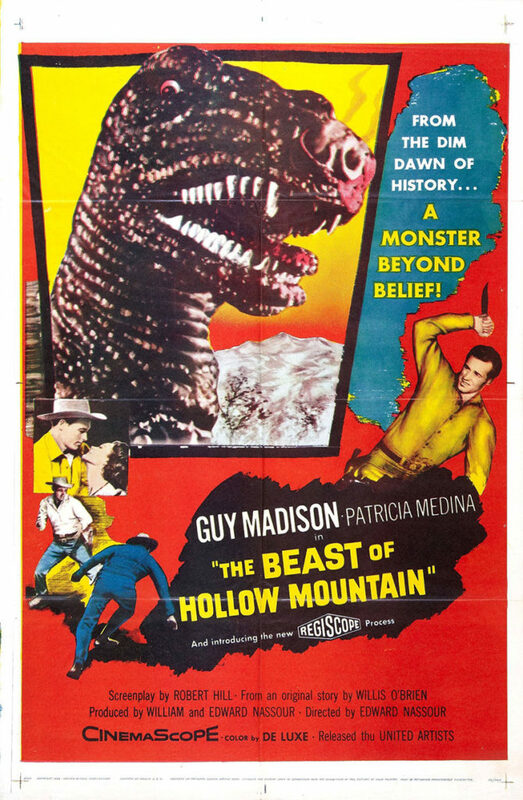 The Beast of Hollow Mountain is yet another film artifact. It’s a film that comes close to success but fails spectacularly at the end. Because of that, Alien: Resurrection is a better film.